How do I add Parts that will not be charged to or seen by the customer? Any items included in the Parts section will be added to the Requisition Document, only if the Technician is logged into a Truck. 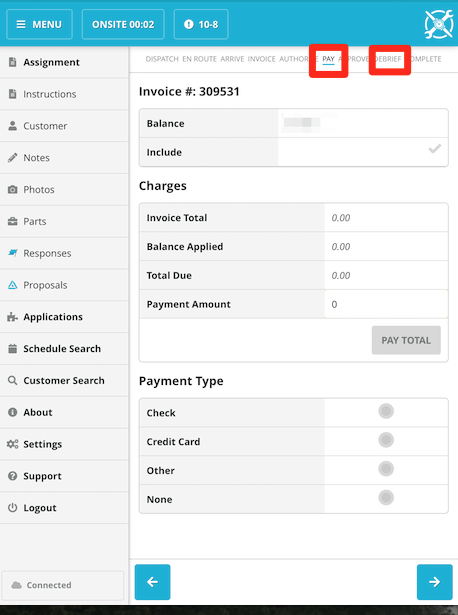 Upon Clicking the Parts button (which can be selected on the Payment and Debrief Job Screens, you will see the Tasks and Visits that are on your Invoice). You will need to select one of the Tasks or Visits and then it will show you any Parts already attached to the Line Item. Here you will also be able to select Add or Scan to add additional Parts. You can also remove a Part if it was not used by clicking the Red Circle with an X in the center of it.